Labradorite sharpens the mind and amplifies visions. This stone provides clarity and insight into your dreams. Put one under yr pillow for restful sleep and to help remember dreams. It increases intuition and decreases anxiety. It aids wisdom and psychic abilities. Said to greatly help your resolve with weight loss. Spectrolite with its subtle green / blue / yellow metallic iridescent shene helps brings forth a person's strengths to share with the world and helps us relate to others. 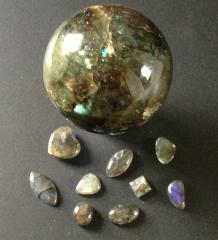 Labradorite is associated with the zodiac signs Leo, Scorpio and Sagittarius. It is also linked to the planets Uranus and Pluto. Labradorite actives Manipura - the Solar Plexus Chakra ( 3 ) and Ajna, The Third Eye Chakra ( 6 ).